Kenton County Judge-Executive Kris Knochelmann and County Commissioners Beth Sewell, Jon Draud, and Joe Nienaber presented PDS staff with a GIS proclamation during their November 14, 2017 Fiscal Court meeting. 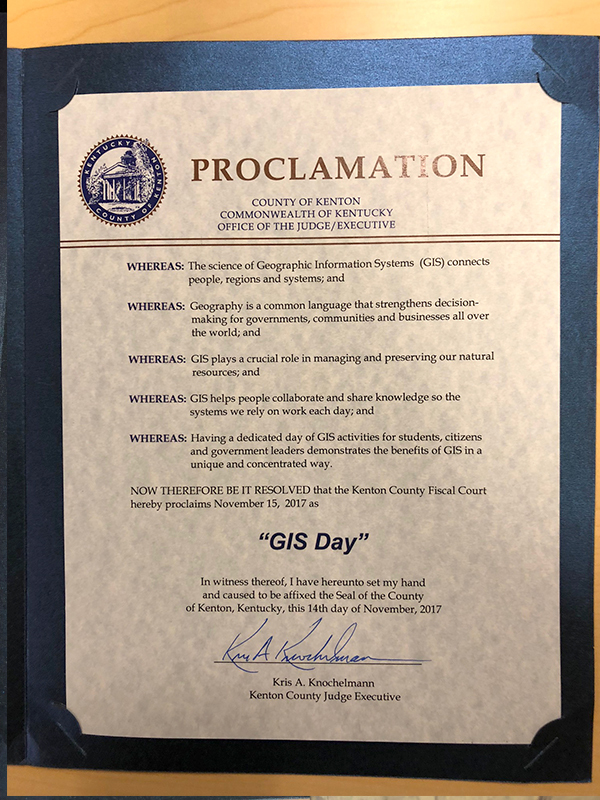 The proclamation recognized Wednesday, November 15, 2017 as GIS Day in Kenton County. Louis Hill, AICP, GISP, Geospatial Data Analyst, and Ryan Hermann, Associate GIS Specialist, attended the Fiscal Court meeting to accept the proclamation on behalf of PDS. 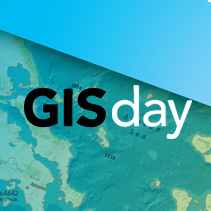 GIS (geographic information systems) is the mapping and analysis technology that PDS/LINK-GIS provides to the citizens, governments, and agencies in Kenton, Campbell, and Pendleton Counties. For additional information about PDS’ GIS outreach offerings, email Ryan Hermann or Louis Hill, or call either of them at 859.331.8980. PDS recently added video and photography capabilities from an unmanned aerial vehicle (UAV) to the services available to all Kenton County jurisdictions. Photos, videos, ortho-mosaics, 3D renderings, elevation profiles, volume calculations, digital terrain models, digital surface models, emergency services, accident reconstructions, and search and rescue flights are now available through its One Stop Shop Program. Utilizing the UAV and Esri products such as Dron2Map, PDS can assist Kenton County communities create up-to-date imagery for small areas. Drone2Map allows for quick turnaround time—sometimes in as little as a day—of products such as ortho-mosaics. PDS has a Typhoon H, a hexacopter produced by Yuneec. The Typhoon H is equipped with a 4K video and 12-megapixel camera. It is capable of flying 400 feet high (the maximum height allowed by law) and can fly up to a mile away from the pilot. Associate GIS Specialist Ryan Hermann, PDS’ UAV operator, is a certified remote pilot having achieved his license in May 2017 becoming one of the first government-operated UAV pilots in the Greater Cincinnati Area. If you have questions about the rules and regulations, UAV products, projects, or general UAV questions, email Ryan Hermann or call him at 859.331.8980. LINK-GIS is all about data. Thirty-two years’ worth of data. Fourteen terabytes of data… a number that grows incrementally each day as the world changes around us. · Over 2017 PDS processed 954 building permits; each new building prompts changes to GIS data. · PDS inspected 7,540 linear feet of surface asphalt and 2,525 linear feet of concrete streets during 2017; each foot of new pavement prompts changes to GIS data. · Staff filled over 1,880 public and private requests for data and maps during 2017. It also sold over 60 gigabytes of digital data. · The linkgis.org website serves 13,159 users monthly; 6,088 of those users are unique. When you look around your neighborhood and community and see change happening, understand that that change will prompt LINK-GIS to update its data. For more information about purchasing maps, data, or analyses, visit the LINK-GIS website, email Trisha Brush, or call her at 859.331.8980. Subdivision activity was on the rise in Kenton County during 2017. Staff saw activity that was on par with levels not seen since prior to the recession. That bodes well for 2018 when many of those lots will be available for sale. PDS staff approved 11 improvement plans in 2017. Improvement plans contain the detailed infrastructure design that is proposed within a subdivision. These plans are required to be approved prior to the construction of any infrastructure. Hiles said that there was approximately 9,000 feet of new subdivision street that was installed in 2017. However, about half of that street total came from improvement plans that carried over from previous years. “There was over 4,200 feet of street approved in 2017 that won’t get built until next year,” said Hiles. Infrastructure that was constructed during 2017 resulted in the creation of more than 500 new building lots on 480 acres. Staff also processed 69 minor subdivision plats totaling 440 acres. There is no public infrastructure construction associated with minor subdivision plats according to Hiles, but it is another indication that land platting activities were high. In addition to the infrastructure contained on approved improvement plans that won’t be installed until 2018, Hiles noted several new developments that were approved in 2017 won’t be the subject of improvement plans until 2018. “There was a combination of seven new subdivisions or new additions to existing subdivisions that was submitted this year. Four of those developers aren’t planning to begin infrastructure construction until spring of 2018. So that infrastructure will be over and above the 4,200 feet of street that will carry over from 2017 approvals,” said Hiles. While most subdivision activity remains in the City of Independence, it’s interesting to note that several of the new developments and new additions to existing developments that will take place next year are in the Cities of Covington, Erlanger, and Villa Hills. Applicants for zoning and building permits, building plan reviews, subdivision plat reviews, and subdivision improvement plan reviews will be able to submit them to PDS in digital form beginning next month. They’ll be able to complete the entire application process—application and plan submission and payment of fees—online by the second quarter of the new year. PDS acquired licenses recently for BlueBeam software to drive this digital plan review process. The program will help PDS communicate with applicants using customizable, easy-to-mark-up tools which will help project coordination by tracking mark ups and generating reports automatically. It will also store all of its records in TRAKiT, PDS’ electronic development-tracking program. More information about Bluebeam software is available here. Sims believes most of the learning curve process will be completed by April for those who begin submitting digital plans in January. PDS will move to online applications later in the fiscal year when it activates eTRAKiT, a module of its TRAKiT electronic development-tracking program. Staff is in the process now of developing the application process, online payment tools, and avenues to attach documents such as plans and worker’s compensation and geo-technical reports, etc. For applicants who prefer face-to-face interactions, staff is working toward installing a kiosk in the agency’s permit office that will facilitate digital submissions with someone near to help if necessary. Looking forward, Sims and Hiles look forward to the day when their staffs will no longer need multiple sets of plans for each project. “We’ll be able to deliver digital plans to those individuals and agencies who require a copy of our submissions for their reviews… and we’ll be able to accomplish that without the help of the US Postal Service or a vehicle. It will be so much more efficient for all concerned,” concluded Sims. For more information, contact Brian Sims or Scott Hiles or call them at 859.331.8980. PDS of Kenton County, the Kentucky Department of Housing, Buildings and Construction, and AIA Northern Kentucky are pleased to announce a professional development opportunity. The 2015 International Existing Building Code (IEBC) will soon replace the premise of Chapter 34: Existing Buildings within the 2013 Kentucky Building Code. This is your opportunity to learn what this means and how you’ll benefit. COURSE DESCRIPTION: This course suits building officials and design professionals who work to restore and re-use existing buildings in Kentucky. The Kentucky Building Code and IEBC intend to provide flexible alternative approaches to safeguarding public health, safety, and welfare without compromising the original character and use of buildings as they are repaired and altered for today’s needs. cards and will provide receipts for reimbursement purposes. "Winston Avenue is one of the gateways into Covington. It has unique opportunities and challenges with industrial and commercial uses on one side and residential uses on the other. Instead of using Winston Avenue as a border between the two, the complete street approach facilitates its use as a bridge,” said Ryan Kent, GISP, Principal GIS Data Analyst. Over 400 citizens took time recently to provide their thoughts on the future of active transportation in Kenton County through an online survey. The survey was part of the public engagement portion of Kenton Connects, a study to assess bicycle and pedestrian conditions, discover potential issues, and begin to define priorities for an update of Kenton County’s bicycle and pedestrian plan. While staff is still working on a detailed analysis, preliminary results of the survey show safety, connectivity, access, and convenience as the major themes and important issues. The survey was promoted across multiple platforms including public service announcements on Spectrum cable television, social media outreach, distribution through local jurisdiction emails and newsletters, and providing paper copies and flyers at numerous locations across the community. Complete results from the survey will be available soon on the Kenton Connects website. Research on crashes, bicycle counts, and sidewalk and bicycle facility connectivity are just some of the many topics that have been examined already throughout the county. Identifying and understanding Kenton County’s existing infrastructure and safety conditions will facilitate more informed decisions and recommendations when creating the plan. The next phase of the project will begin setting benchmark goals based on existing conditions and survey information. These goals will be used to create measurables that can be reviewed in the future to evaluate success and help implement future policy and planning decisions. To stay up to date on the bicycle and pedestrian plan, visit KentonConnects.org to learn more and to join the project email list. Email Chris Schneider or call him at 859.331.8980 with questions or for more information.